From the Prologue to the book by Fr. Dionysios Tambakis titled When the Saints Have Humor: Strange Stories of the Saints (Greek). Recently I visited the holy Elder Nektarios in Kamariza of Lavrio, and I have met other sanctified figures in my life (St. Paisios, Fr. Ephraim Katounakiotis, Fr. 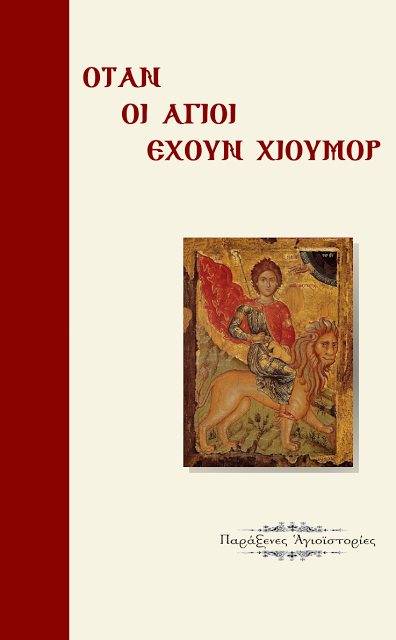 Haralambos Dionysiatis, Fr. Ambrose Lazaris, Fr. Evmenios Lampakis, Fr. Kyrillos Gerantonis and others) and have made the following discovery: "Ultimately all the Saints smile and above all have humor." And indeed it is of such a humor that produces both love and benefit. How is it then possible for a prostrated man who is 85 years old with a thousand and two illness on him, to be so clever and beneficial and for his face to smile and glow like young carefree children? "Elder Nektarios, will we go to Paradise?" "Not even the outside of it will we pass." "What are you saying, Father?" I yelled frustrated. "We will not eventually enter?" "Well, if we put on a strike God will let us in!" "Father, what are you doing here, in such a remote cell?" "I'm watching so the ants won't quarrel." Therefore the biggest humorists and playful people, who serve God as cheerful swallows, are the Saints. They are those who proclaim freedom and holy madness and at the same time rebuke enslaved humanity for their hypocrisy and pseudo-seriousness. The playfulness of the Saints is needed and necessary for our world. It is a way to ridicule the world that thinks it can mock God and His truth. Because the only thing Christ longs for is to see His creatures happy and free like birds who endlessly fly in new heavens, beyond hypocritical and false virtues, which are legislated in a "good" society.